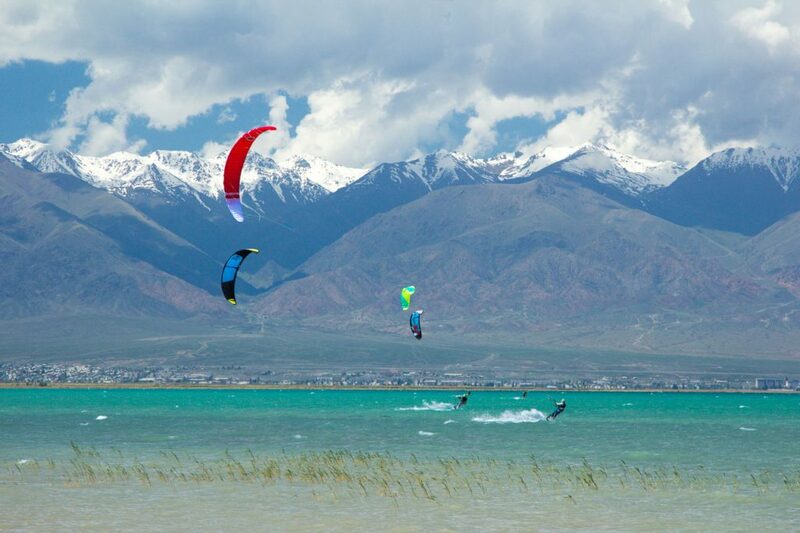 Check out the detailed review of the only good place to kitesurf at the Issik-Kul lake, Kyrgyzstan. The only place with the good wind conditions is the western shore of the lake. The local largest village called Balykchy at the A365 highway. It takes around 2 hours and 180km to get here from Bishkek. 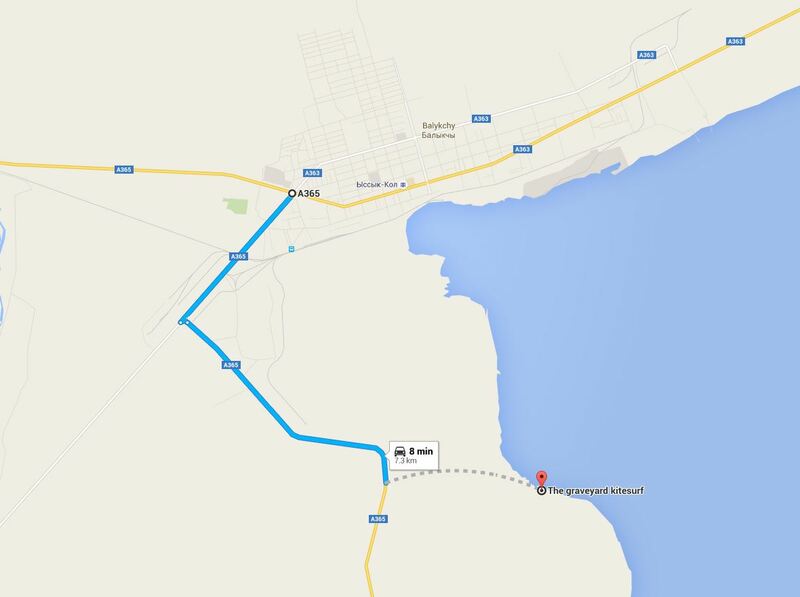 A lot of cafes and some small hotels available all around the Balykchy but if you want to hang out around the Blue/South lagoon kitespot then there is a new small guesthouse in the nearby Ottuk village. Unfortunately no breakfast or any cafes available around. Also it is good to go into nearby mountains and camp with a stove and a tent. You can travel all around Balykchy village to find your own perfect spot depending on the wind, but overall there are only two good spots. There are two basic types of winds walking around this place. The ULAN which is a strong gusty NW sideshore/offshore wind and SANTASH which is a soft thermal E/SE sideshore/onshore wind. The wind conditions are not constant. The season starts in March when there are still snow in the mountains and water is freezing cold and ends in November. April, May and June are good for quite frequent Santash winds. Santash getting weaker during the midsummer and getting stronger in the autumn. Santash is quite soft thermal wind and is good for any levels of kiteboarders. You can expect Santash winds at 8-20 knots. Sometimes it is suitable for 18+ m kites and sometimes it is so light that you can’t go upwind or even fly a kite. The Ulan is basically a storm wind. It comes when the weather changes. Therefore it is super gusty and not recommended for beginners. You can catch it up anytime during the season. You can expect Ulan winds at 20-40 knots with gusts depending on the spot, weather, clouds etc. We have a windguru weather station installed at the Balykchy boat station. You can check it live here. There is also a few spots at windguru forecast (balykchy, south lagoon), but there is a trick, simply multiply the current forecast value by 3 and you will get a sort of correct wind values. As the conclusion you can get 3-5 out of 7 days kitesurfing in different wind conditions and with different kites. 12-18m kites are good for Santash winds. 7-12m kites are good for Ulan winds. This spot is superb for a thermal Santash winds. Shallow water, nice and warm lagoon (during the summer) and great views. It is also a great place for kite surfing at Ulan winds because it has much softer gusts compared to the Greaveyard kitespot. The spots can be easily found with google maps. Each spot has own mark. This spot is good for experienced kitesurfers when the ULAN wind blows out. The gusts here can reach 100% (20 to 40 knots in a moment). The Santash wind at this place is much weaker then at the Lagoon. 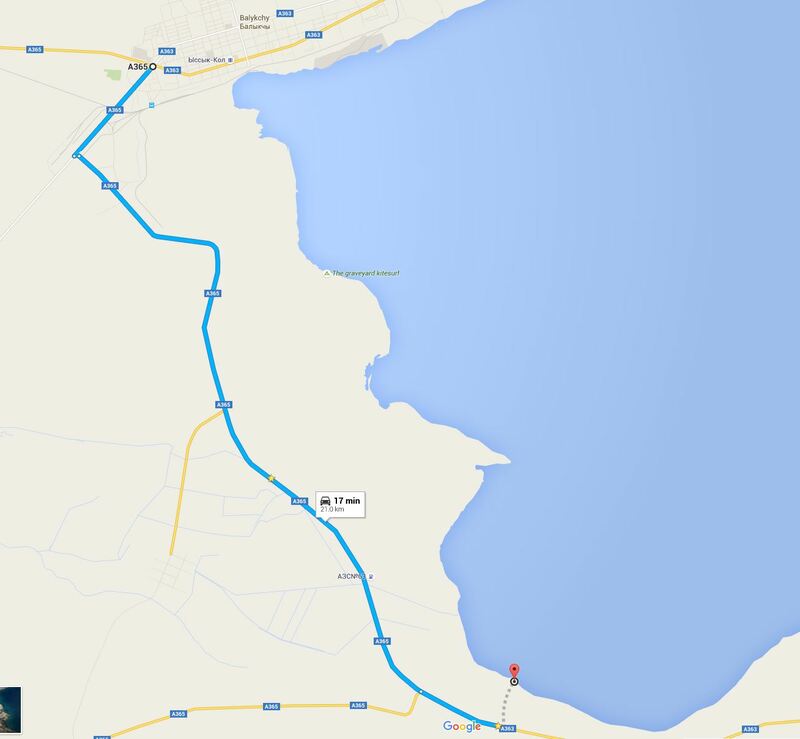 It is around 9 km from Balikchy towards the south shore. Turn to the beach right after 5th km sign, there is sort of road right before the cemetery.